This Indian village scene sits on the shore of the Rivers of America in Frontierland. I snapped this picture in July while riding on the Liberty Belle Riverboat. Toward the back of the shot you can see the tracks where the Walt Disney World Railroad travels. When riding on the train, you get a different perspective of the same scene. It is amazing how realistic some of these Indians actually look. I snapped this shot about a month ago while giving a tour at Hollywood Studios. This is a view of the backside of the New York City area of the Streets of America. Disney intentionally left this steel "skeleton" open to show guests how buildings are created for the movies. While walking down the center of the street you'd have no idea that what you are looking at are "false fronts." This is just one example of how we get to peek behind the scenes and learn about interesting movie making techniques when visiting Hollywood Studios. Many of you who saw the title of this picture are probably saying, "What railroad?" Unless you visited the Fort Wilderness Campground in the 1970s, you probably wouldn't have known that there were steam trains that traveled around this property. However, I heard that there were still "remnants" of this railroad that can be seen if you look hard enough. Last month, I went on a quest (a very long walk) to find any artifacts from this extinct attraction. As I was walking along one of the main roads, I spotted these railroad ties and felt like I found a buried treasure. From what I've read, the railroad was a fun mode of transportation to travel around to the different campsites, but due to maintenance and safety issues it didn't last very long. However, several of the coaches were transplanted to Pleasure Island and used as ticket booths for many years. I took this picture a few weeks back while spending a night at the Kidani Village section of the Animal Kingdom Lodge. When I snapped this shot, I was standing in a Kidani hallway looking across the savanna at the Jambo House section of AKL. In addition to some amazing views, both areas of this resort offer guests great dining choices, fantastic pools, and wonderful theming. As I've said in the past, the Animal Kingdom Lodge would be a fun vacation destination even without the theme parks nearby. I took this shot of the Magic Kingdom canal from one of the bridges connecting the hub to Tomorrowland. The canal encircles the hub and even breaks off into Adventureland. The "landing" seen on the right side of this picture was once home to the Plaza Swan Boat attraction. Back in the 1970's guests were able to take a leisurely cruise on these boats that plied the Magic Kingdom canal. On the left side of the photo you can see part of Cosmic Ray's Starlight Cafe, which is a large quick-service restaurant in Tomorrowland. This shot of two pirate skeletons playing chess can be viewed in the righthand queue at Pirates of the Caribbean. You need to look down into the dungeon to see this very interesting scene. If you examine the chess board (and you are a fan of chess), you will see that the game is locked in a "stalemate" where there can be no winner. During a refurbishment of the attraction back in the 90s, the chess board was disturbed and the pieces moved. The Disney cast members had to go back to original drawings by Marc Davis, the Imagineer who designed this scene, to discover exactly how the chess pieces needed to be positioned. This is one of those situations that 99.9% of guests would never know about, but Disney prides itself in getting even the smallest details accurate. I took this shot of Tomorrowland Speedway from the new walkway leading up to the indoor queue for Dumbo. The Speedway is the only Tomorrowland attraction that was there on opening day in 1971. Back then it was called the Grand Prix Raceway. These "racing" cars are powered by Briggs & Stratton 9 horsepower engines and they reach a top speed of 7.5 miles per hour. There are a total of 146 cars at a cost of approximately $6,000 each. I snapped this shot of Bay Lake while riding on a boat traveling from Fort Wilderness to Wilderness Lodge back in July. Bay Lake Tower, the Contemporary Resort, Wilderness Lodge and Fort Wilderness all sit on the shores of Bay Lake. This is the body of water that Walt himself flew over back in 1963 when he decided that this would be where Walt Disney World would be built. In fact, that flight took place on November 22, 1963. When Walt's plane landed, he was informed of the terrible news that President Kennedy was assassinated. Off Kilter is a great Celtic Rock band that performs at Epcot's Canada Pavilion. They are very talented and versatile musicians who entertain park guests on a daily basis. This clip features a portion of the Bryan Adams hit "Kids Wanna Rock." I shot this on the afternoon of July 19th so it is a little hazy due to the Florida humidity. . Although the Swiss Family Treehouse has been around since opening day at the Magic Kingdom, I snapped this shot just a few weeks ago. This is a re-creation of the famous tree from the 1960 Disney movie Swiss Family Robinson. The family in the film used may objects from their shipwreck to furnish their new "home." While passing by this room in the tree, you can hear the famous organ music from the movie playing in the background. The name of the piece is Swisskapolka. The only "live" part of the tree is the Spanish moss hanging over the branches. Also, the Swiss flag at the treehouse is the only non-American flag hanging over a Walt Disney World attraction. I took this shot of Pinocchio Village Haus while riding on Prince Charming's Regal Carrousel last week. This large quick-service restaurant shares a building with "it's a small world." You can actually look down and see the loading area of that attraction while eating in the restaurant. In the old days, Dumbo would block about half of this view, as it was located in between the Carrousel and Pinocchio Village Haus. However, that attraction recently moved to Storybook Circus and doubled in size. The Vision House is a relatively new exhibit at Innoventions in Epcot. It is a tour of a Disney created home that highlights ways to "go green." This photo of the kitchen shows several energy saving appliances. There is also a tablet style computer on the counter that helps to "run" this home. Many of the products found throughout the house seem futuristic, but they are all currently available to consumers. If you are interested in energy conservation and ways to make your home more environmentally friendly, I definitely suggest taking a tour of the Vision House. I snapped this picture last week while on the walkway from the Magic Kingdom to the Contemporary Resort. This monorail is part of the "resort line" and stops at the Contemporary, Transportation and Ticket Center, Polynesian Resort, Grand Floridian Resort and the Magic Kingdom. 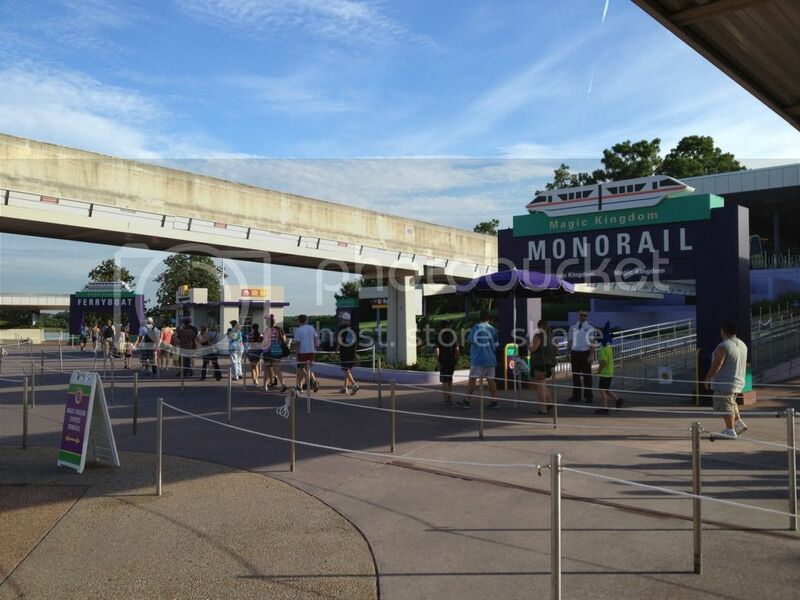 The other track is for the express monorail between the TTC and the Magic Kingdom. When staying at the Contemporary, the walkway is the easiest way to get back and forth to the Magic Kingdom. It also allows for interesting views of the monorail! I took this shot last week from the Polynesian boat dock. This resort was one of two original (along with the Contemporary) that opened along with the Magic Kingdom back in 1971. It has always been one of my favorites. This beach has a lot to offer, including amazing views and hammocks to relax in. You can see a large, inflatable movie screen in the distance. Each night, they play a different Disney movie for resort guests to enjoy right on the beach. Guests can also get a good view of Wishes at the Magic Kingdom as well as the Electrical Water Pageant. Like so many other Disney resorts, the Polynesian is a great place to visit whether you are staying there or not. DDW Pic 354. Lights, Motors, Action! I took this picture while giving a tour of Hollywood Studios last week. Yes, that is a person falling off the roof of a building. This is a pretty amazing stunt show that has everything from car chases to a man who bursts into flames. As if the show wasn't already a hit with young boys, they recently added a Lightning McQueen segment. Lights, Motors, Action usually runs twice a day and the stadium can hold approximately 5,000 guests. If you haven't seen the show, I highly recommend it on your next trip to Hollywood Studios. Ok, so there isn't much of a roller coaster in this picture. I took this picture last week in Fantasyland at the Magic Kingdom. This area is going to be the last part of the Fantasyland expansion. The Snow White themed "family" coaster will be less intense than Thunder or Space Mountains, but it sounds like it will be a lot of fun. It is utilizing a first of its kind coaster system that will simulate the swaying motion of a real mine car. Most of the "new" Fantasyland will open on December 6th of this year, however, we will have to wait until 2014 to enjoy the Seven Dwarfs Mine Train Coaster. There are many great character greeting locations throughout the Walt Disney World parks. One of the best for young boys can be found in Hollywood Studios. 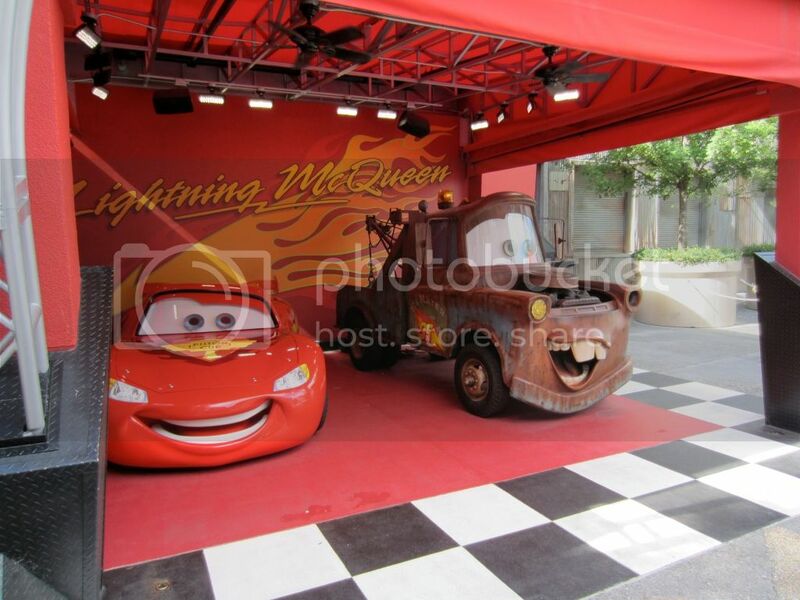 In the Streets of America area, you can get your picture taken with both Lightning McQueen and Mater. This is very exciting for fans of the movie Cars. You can visit these two movie stars throughout the day without waiting for too long. The lines tend to be longest after each Muppetvision show lets out. When you leave the Muppets and look to the right, you can't miss Lightening and Mater. However, Phineas and Ferb also reside in that area so they tend to absorb a good amount of the crowd as well. 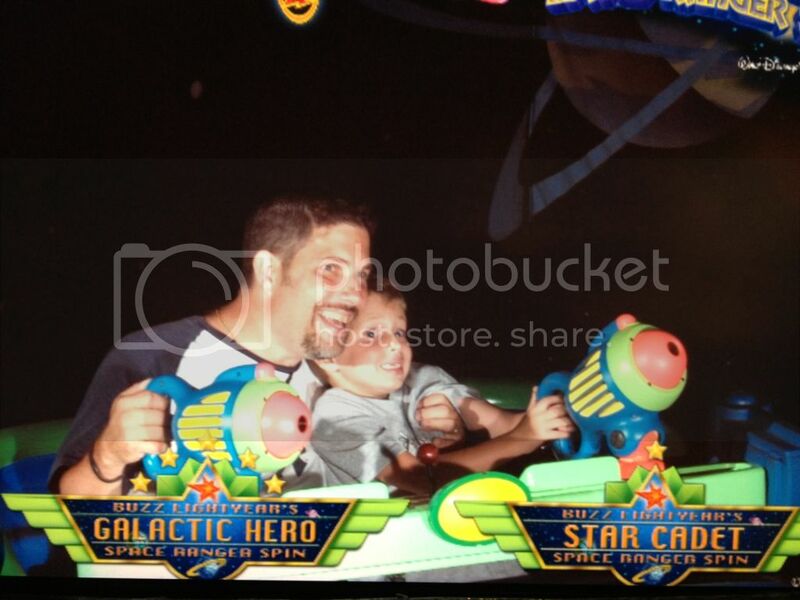 Here is a "live action" shot of me and my little man enjoying Buzz Lightyear's Space Ranger Spin on Sunday. Opening in 1998, this attraction has been a favorite of young boys for many years. The original ride that occupied this spot was called "If You Had Wings" and was a fun trip to exotic locations around the world. It was also a great advertisement for Eastern Airlines, who was the corporate sponsor of the attraction. With the incredible popularity of the Toy Story movies, Buzz Lightyear's Space Ranger Spin should be around for many years to come! I took this picture today while standing in the lobby of the Kidani Village section of the Animal Kingdom Lodge. 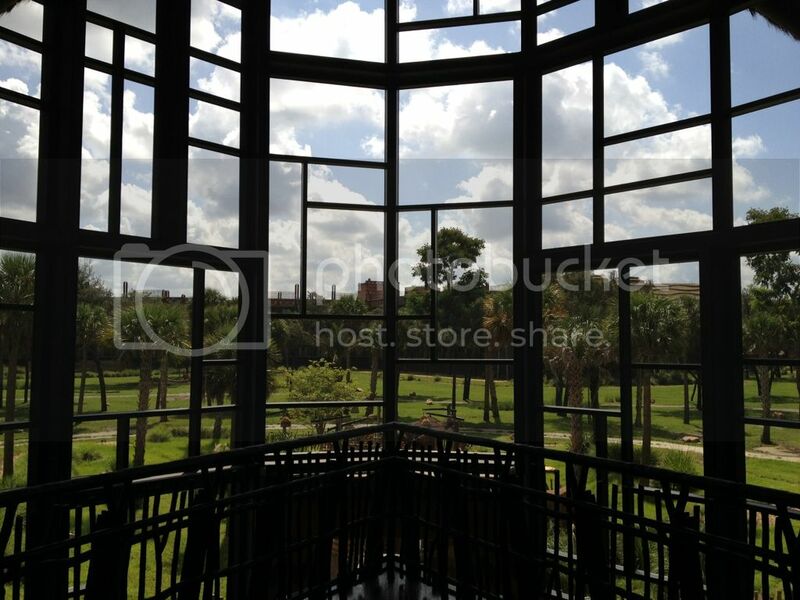 The building has huge windows that provide a spectacular view of the savanna. 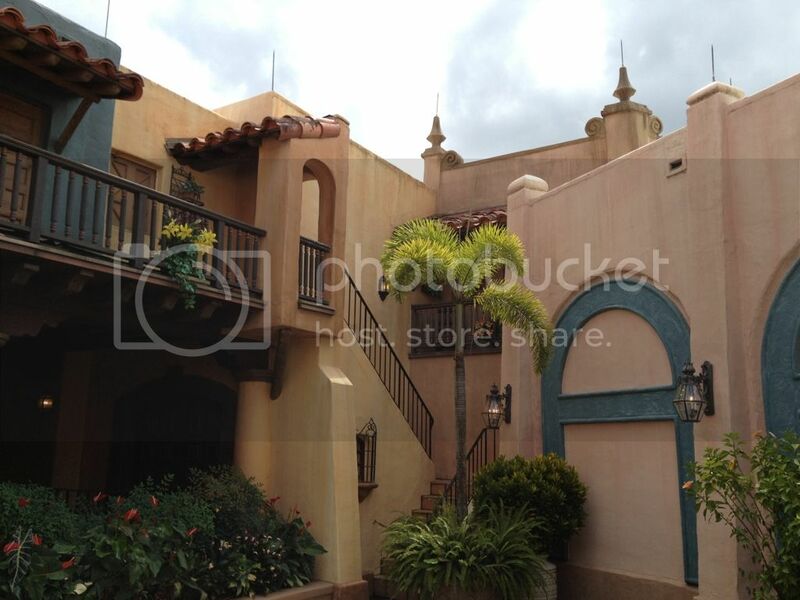 There is also a staircase that allows guests to walk down to an outside viewing area as well. Even if you aren't staying at this resort, I highly recommend visiting. As I've mentioned in the past, the Animal Kingdom Lodge is a destination unto itself with so much to offer. The new Fantasyland Railroad Station is full of great details. 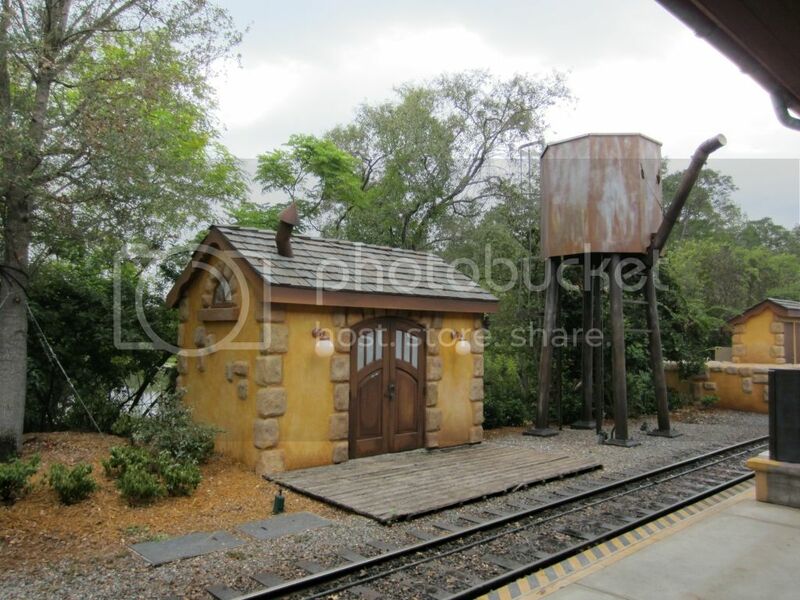 I was standing on the platform when I took this shot of the shack and water tower across the tracks. This is a real working tower that periodically fills the steam engines with water. As usual, Disney has done everything they can to make this attraction as authentic as possible. Spaceship Earth at Epcot has gone through several changes over the years. Although I was more of a fan of the earlier years of the attraction (specifically the Walter Cronkite narration), the newest version is still a lot of fun. 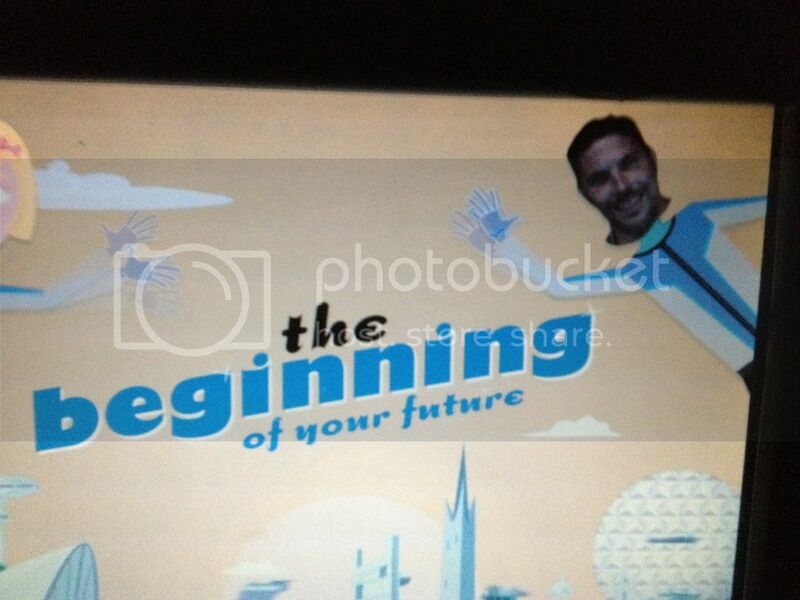 The current version is interactive and allows you to create your own "future" while in the descent portion of the ride. I snapped this shot right near the end of the attraction. You will notice my little image in the upper right corner. I've taken many pictures of Cinderella Castle over the years. However, this one that I snapped this morning is from a rather unique angle. I was riding aboard the Astro Orbiter in Tomorrowland when it was taken. 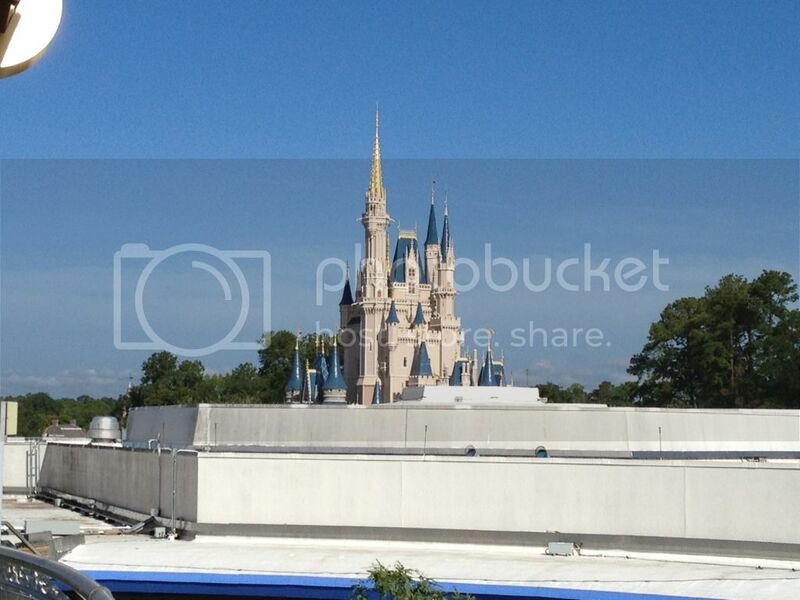 The roof that is seen in the foreground is from the building which houses the "Stitches Great Escape" attraction. I also took a full ride video on Astro Orbiter which I will post in the future. I always like to find interesting "nooks and crannies" around the Walt Disney World parks. This example is from next to the queue area at the Pirates of the Caribbean. Even though this is a spot where guests don't pass through, Disney still does an amazing job with the theming and details because this area can be seen by curious visitors. The next time you are at this attraction queue, walk over to the far right near the water fountains and you will see this little alcove. 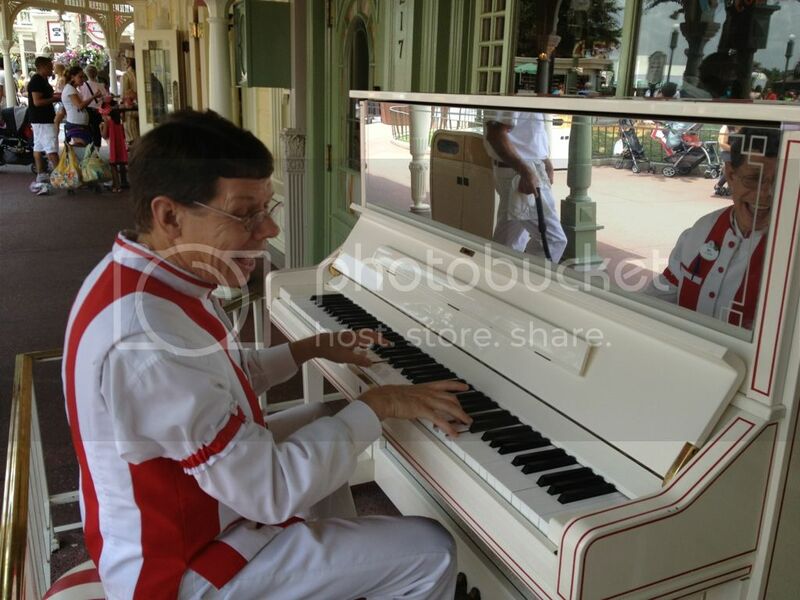 Jim the piano player is a Magic Kingdom treasure. He has been tickling the ivories in front of Casey's Corner for many years. He is extremely talented and very friendly. He takes requests from guests and even let's kids hit notes on the piano with his guidance. I took this picture a few days ago while giving a tour at the Magic Kingdom. I had the chance to visit the newest section of the Art of Animation Resort today. 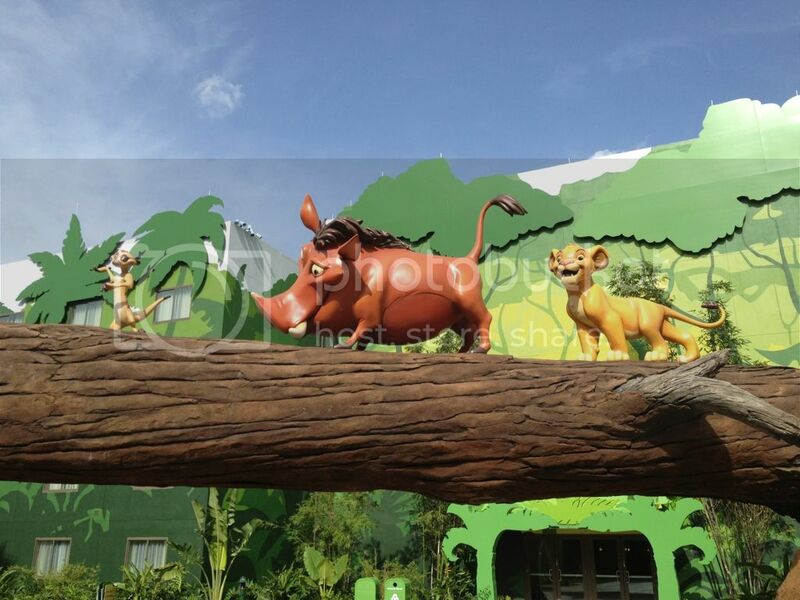 The Lion King section doesn't officially open until Friday, but guests are now allowed to walk through the grounds. Like the other areas of the resort that are already open, this section also features family suites that can sleep up to six. The final wing, themed to the Little Mermaid, will open next month and have regular "value" category rooms. If you are a fan of one of the movies featured at the Art of Animation Resort (and who isn't), this is a great place to stay. This "Pic of the Day" was actually taken today. I was waiting to meet a group that I would be touring with, and snapped this shot at the Transportation and Ticket Center. It was interesting to watch some people head to the ferry boat while others chose the monorail. I typically choose the ferry boat in the morning for several reasons. First, there is typically no line for the boats, which hold 600 passengers each. Second, it is a comfortable time of day to enjoy a ride on the Seven Seas Lagoon. Finally, it is fun to approach the Magic Kingdom from the water. It builds the excitement for what lies ahead. Epcot is my favorite park to walk around in the early evening. 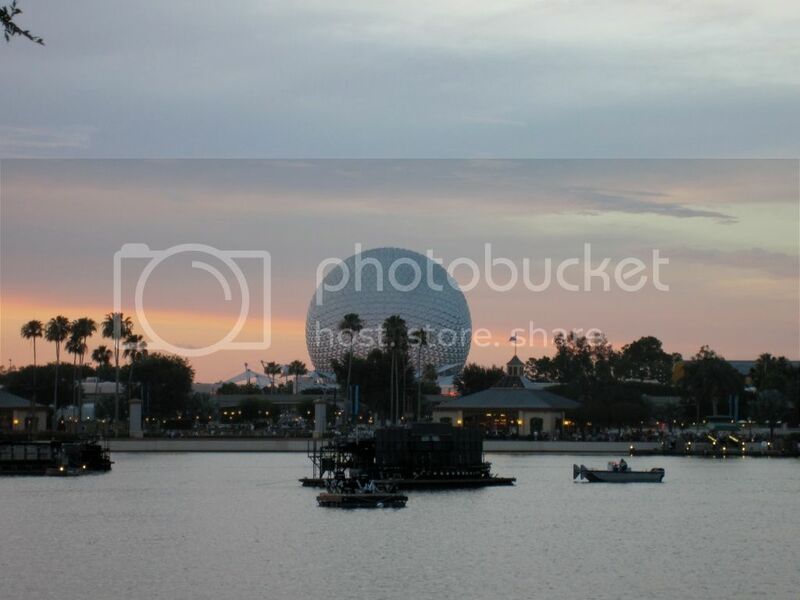 I specifically like the views around the World Showcase at sunset. The temperature tends to be relatively comfortable at this time of day. Also, Epcot is a great place to enjoy an international dinner followed by Illuminations. There are few better ways to end a Walt Disney World day. Main Street, U.S.A. in the Magic Kingdom is a fun place to visit at anytime during the day, but it has an extra special feel when the park first opens. 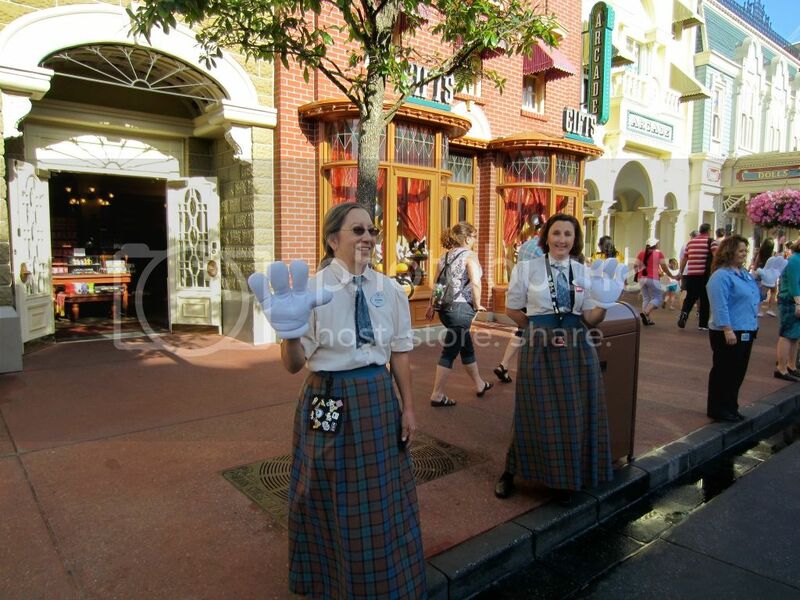 Cast members line both sides of the street and greet each person as if they were a guest entering their home. They all have big smiles on their faces and big Mickey Mouse "hands" waving at the arriving visitors. It is this human touch that makes this amazing place so inviting and friendly. There are many fun amusement parks around the country, but it is the cast members who make the Magic Kingdom stand out from all of the rest. 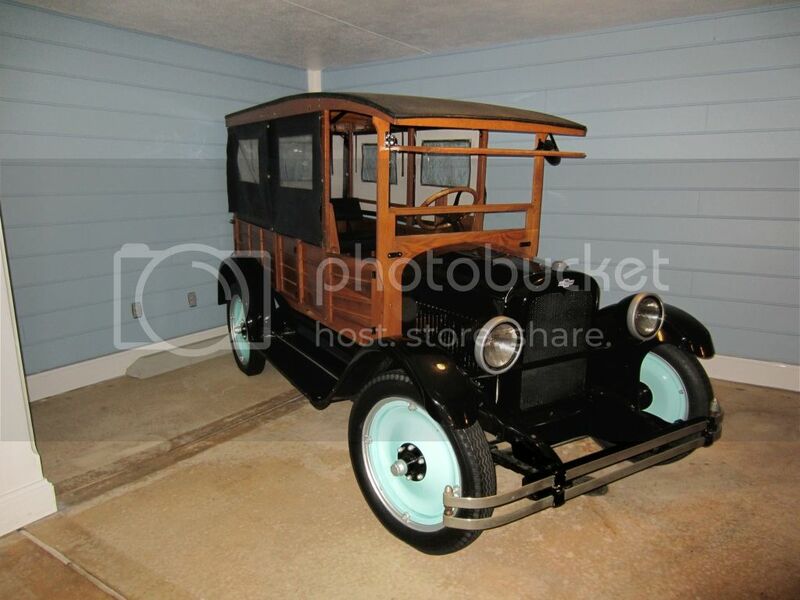 This antique car is sitting just outside of the front entrance to Disney's Beach Club Resort. It enhances the theme of an early 1900s New England style hotel. Nobody would complain if the car wasn't there, but this is just another example of how Disney goes the extra mile to create an amazing and unique environment at each of their resorts. This shot was taken of a construction wall over in Epcot. These walls are put up whenever Disney is refurbishing an attraction or building something new. In recent years, they started putting up quotes, like this one from Walt Disney. Not only are the quotes interesting, but they make the construction walls less of an eyesore. 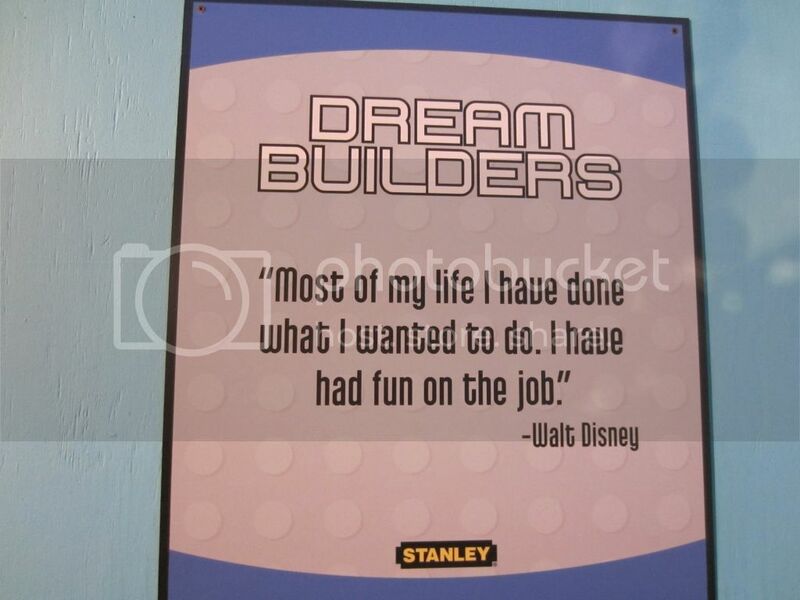 This particular quote hit home, as I am certainly having "fun on the job" as a private tour guide at Walt Disney World. 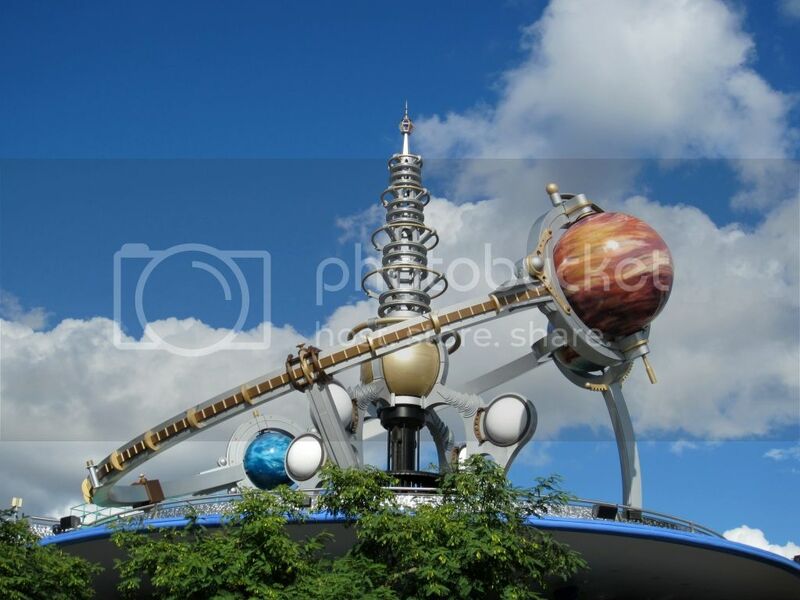 The Astro Orbiter is an icon in Tomorrowland. When it opened in 1974 it was called the Star Jets. Although it works on the same principle as Dumbo, it is a little more thrilling because of its height and slightly faster speed. The rockets spin at a speed of 11 revolutions per minute and travel 1.2 million miles per year. This picture was taken near the Japan pavilion at Epcot back in June. These large "boulders" aren't typically open during the day. Just prior to Illuminations, small towers rise out of the landscaping to reveal speakers and lights that are used during the show. Disney does an amazing job of keeping this equipment hidden until it is needed. This particular rock was only partially open, which means they were probably doing some maintenance on it. The next time you are at Epcot waiting for Illuminations to start, take a close look at the "rock work" as you may see it come to life! This video was taken shortly after 2:00 am on the morning of June 16th, 2012. The Magic Kingdom had "Extra Magic Hours" that night and their were very few guests still in the park. You will hear the "Kiss Goodnight" in the background where Disney thanks their guests for coming and wishes them a safe trip home. If you ever have the opportunity to be there at closing time, especially after Extra Magic Hours, I highly recommend it. There is a whole different atmosphere when the huge crowds are gone.